Karen David is joining The Originals spinoff, Legacies as a witch who may or may not be Alaric's new love interest. Get all the details right here. Legacies is the successor to The Originals, and The Vampire Diaries and the first photos are giving us serious The Vampire Diaries pre-college vibes. Jeremy Gilbert is returning to Mystic Falls! Steven R. McQueen has signed up to appear in an episode of Legacies this fall on The CW. Get all the details. Paul Wesley is not leaving The Vampire Diaries universe behind quite yet. The former star will be involved with new spinoff, Legacies. Get all the details. The cast and crew of Legacies confirmed which The Vampire Diaries stars you can expect to appear on the new spin-off. Who's in? Find out right here. 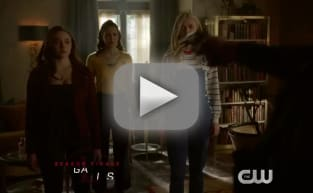 Legacies Trailer: Welcome Back to Mystic Falls! The official trailer for Legacies has been released, and we are totally freaking out about it. Get your first look at Lizzie and Josie Saltzman! Legacies is the latest series set in the universe that The Vampire Diaries and The Originals and we have your first look at the synopsis and the key art!